MX1 to handle satellite transmission for Eurosport 1 HD channel in Germany. Munich, December 2016: MX1, the global media service provider, has been selected by Discovery Networks Germany to handle technical services and satellite transmission of the Eurosport 1 HD channel for all HD+ subscribers. The multi-year contract was signed by Discovery Networks Germany, Eurosport’s parent company, and MX1. MX1’s services include encoding, uplink and delivery in HD via the ASTRA satellite 19.2 degrees East. 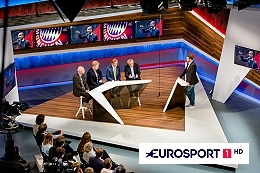 The Eurosport 1 HD channel was added to the HD+ package on December 1st, 2016 and ups the number of channels available to 23.